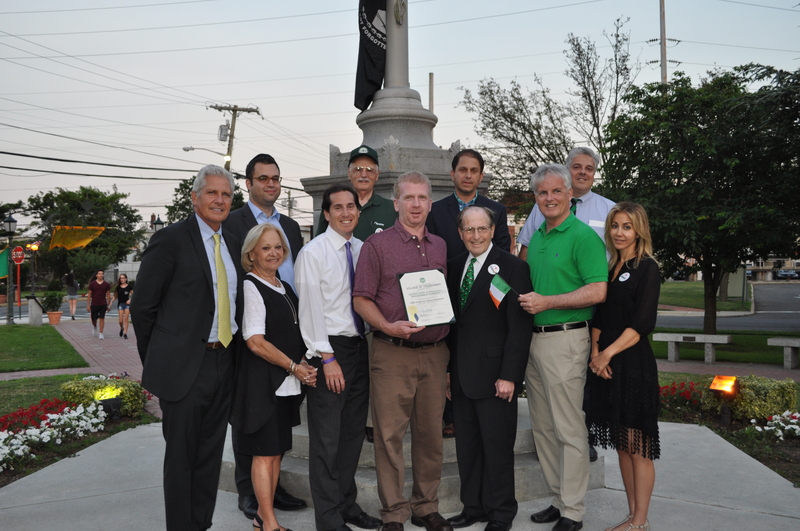 From L-R: Town of Hempstead Councilman Bruce Blakeman, Acting Village Attorney Evan Newman, Trustee Myrna Zisman, NYS Senator 9th District Todd Kaminsky, Depty Mayor Ronald Lazilotta Sr., Vice President Patrick Kerins of Ancient Order of Hibernians, Padraic Pearse Division 3, Cedarhurst Trustee Ari Brown, Mayor Benjamin Weinstock, Chris McGrath representing NYS Senator 2nd District John J. Flanagan, Village Administrator Salvatore Evola and Acting Village Justice Segal Blakeman. Irish eyes were smiling at Andrew J. Parise Park in Cedarhurst, for the second concert of the season. People of all ages gathered around the pavilion with Irish flags held high, while Ellis The Funnyman performed a unique transformational clown show that had children wanting more. The Lavin’s & Company band took to the stage with their traditional blend of Irish music that created a dynamic, vibrant and memorable musical experience in the park. The crowd cheered wildly for the students of The Donny Golden School of Irish Dancing. These boys and girls put on an incredible performance of traditional Irish dance. The Donny Golden School of Irish Dancing is one of the premier Irish dancing schools in the world. On July 19th at 8:00 PM Cedarhurst is bringing in a new act, a tribute to the great singer and songwriter Carole King with the performance by Joey Arminio & The Family. We also invite your family to come and enjoy our playground and water park. You will be happy you did! The concert schedule can be found here or at the Cedarhurst Village Hall on Cedarhurst Avenue.